This innovative cat toilet is both stylish and practical. The Booda Cleanstep Cat Litter Box has plenty of room for digging and scratching, and the cover provides privacy and cleanlineΒ. As the cat leaves the box, the integrated steps in the ramp catch any litter on its paws, keeping the cat and the surrounding area clean. 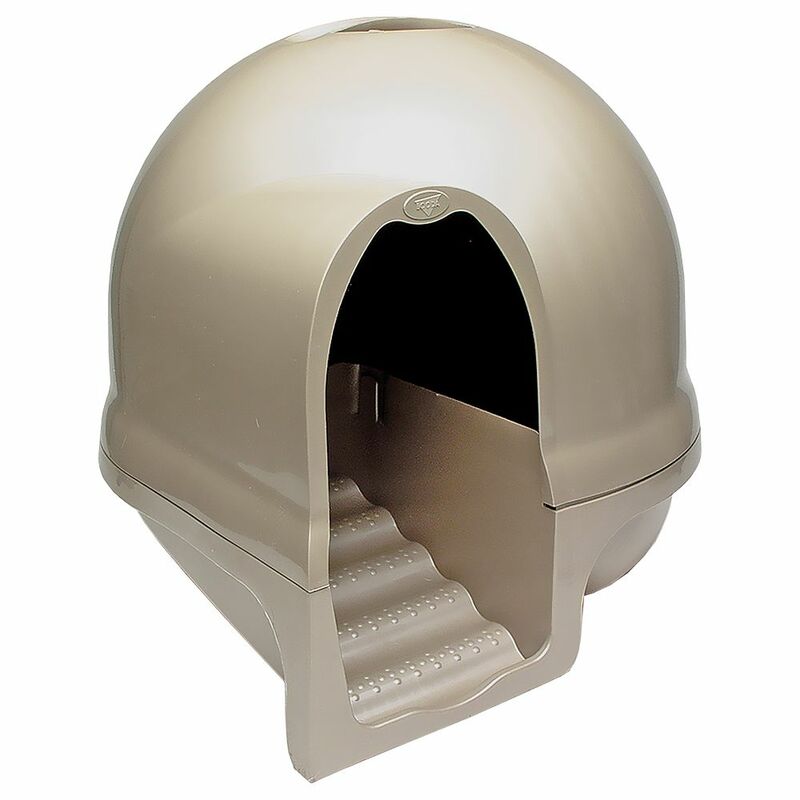 The Booda Cleanstep from Petmate has a spacious interior, with plenty of room for larger cat breeds. The practical high tray design allows you to fill the box with large amounts of litter, and the hooded top design contains any litter scatter, allowing your cat to dig and bury to its heart's content. The Booda Cleanstep Cat Toilet is very easy to clean. The cover features a built-in handle for easy removal and re-aΒembly. The innovative shape has no corners, making clumps easy to remove. An activated carbon filter in the dome of the box reduces unpleasant odours. This filter should be regularly replaced to keep nasty odours at bay. The modern design and pearlescent colours make this functional, practical litter box a stylish addition to your home, whatever the decor –no need to hide the litter box in the corner! The Booda Cleanstep Cat Litter Box from Petmate at a glance: Made in USA Innovative Design With steps to prevent litter spreading Cleans paws on leaving the box Roomy enough for even larger cat breeds High tray design No corners or edges, for easy cleaning Built-in handle in cover Activated carbon filter compartment in cover 1 activated carbon filter included Dimensions: Diameter approx. 55 cm, Height 50 cm Lower tray Height approx.. 15 cm Steps: Width approx.. 23 cm Universal Active Carbon Filters (x3): Click on product number 320012.3 to receive 3 universal active carbon filters. Their initial size is 20 x 15 x 0. 4 cm (LxWxH) but can be cut down to the desired size. When buying replacement carbon filters for this litter box, the filters come 3 to a pack. Price just £34.99! Click here to buy now!